This is the 189th world-famous FOTM Caption Contest! Enter the contest by submitting your caption as a comment on this thread (scroll down until you see the “LEAVE A REPLY” box). This contest will be closed in a week, at the end of next Tuesday, December 11, 2018. 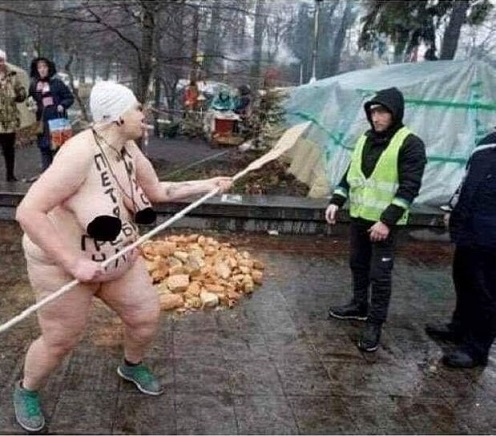 This entry was posted in Humor and tagged Aleksandra Nemchinova, naked obese protester in Kiev. Bookmark the permalink. Olga “Thunder Thighs” Megabuttskiovich corners a prospective husband on Sadie Hawkins day. A Yellow Vest protester wandered into Ukraine and found a more hellish and hopelessly insane place than back home. looks like I found some lunch!